Vigor chooses Vancouver over Portland to build army ships, moving jobs from Ballard and Clackamas. Portland based ship builder Vigor Industrial has chosen Vancouver over Portland. The company announced Friday it will execute a $1 billion army contract at Columbia Business Park in Vancouver, Washington, rather than at its dock in Portland or elsewhere. 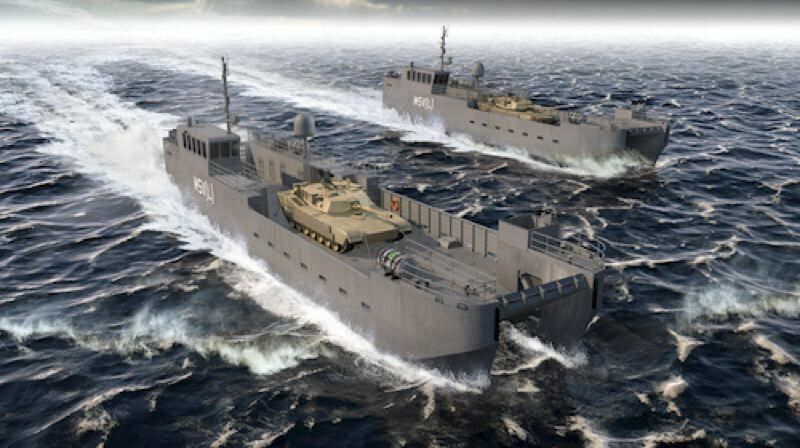 The contract, the largest award in Vigor's history with a total value of $979,390,000 over a ten-year period, calls for one prototype vessel, four vessels under low rate production, and up to thirty-two additional vessels for use by Army Mariners in even the most difficult environments. "Vigor looked in both Oregon and Washington state at building and buying options for this facility. Local, state and federal leaders in both states showed support throughout the process, demonstrating their commitment to the economic benefits and jobs created by strong manufacturing and maritime sectors in the Pacific Northwest." The work will bring 200 new laborer jobs to the site, with two hundred more possible in the future. The Army work will begin this summer, although work from Vigor's Ballard site, which is closing, will move there before then. Kvichak Marine chased the Army contract before Kvichak was bought by Vigor. Workers will be offered transfers from the Seattle area to Vancouver. Sixty jobs at Vigor's factory in Clackamas are also moving to Vancouver. These aluminum fabricators are also being offered transfers. Vigor already has a site in Vancouver near the Kaiser Shipyards, but it was deemed unsuitable for aluminum work. Frank Foti, Vigor CEO, told The Columbian newspaper, "The quality of life is excellent in Vancouver…There is a culture of openness and friendliness that really draws you. There is great access to both rural and suburban living, which appeals to a great number of our craftspeople." Vancouver City Manager Eric Holmes told the paper. "Not only does it bring these kinds of manufacturing jobs to Vancouver, it does so under the umbrella of a 10-year government contract. We capitalized on our status as a riverfront community, and it reflects on the ship building heritage we have in Vancouver." Holmes also told the paper that Vigor's incentives include a cap on building permit fees, expedited permit processing and help with approvals to build a dock in the future. "When I think of (Dave Christensen of Christensen Yachts') alignment with the Vigor values of Truth, Responsibility, Evolution and Love, it's Responsibility and Love that shine through. He stayed responsible to what he built, and his Love for the people who built amazing boats here was proven by Dave's actions many times over." The new ships are more agile and versatile when it comes to landing on different types of shoreline. Soldiers need to land on beaches and rocky shores, often arriving through shallow waterways. An Army spokesperson said in 2017, "The MSV(L) program is specifically designed to deliver a new vessel that enables Army mariners to carry the modern, combat-configured equipment into diverse littoral settings--giving commanders greater maneuver options, especially in anti-access, area-denial environments." A "Milestone C" decision and authorization for low rate initial production of the first four vessels are scheduled for the end of fiscal year 2021, followed by a full-rate production decision in fiscal year 2023. The Army seeks to buy 36 total vessels for use by Army mariners around the world. Vigor is a specialized shipbuilder and complex fabricator. The company merged with Oregon Ironworks in 2014. Oregon Iron Works, located in Clackamas, became a division of Vigor Industrial called Vigor Works. The manufacturing and ship repair company employs about 2,300 people in nine locations in Alaska, Washington and Oregon including 1,100 in the Portland area. Oregon Ironworks made Portland Streetcars. Vigor also operate a large dry dock in Swan Island on the Portland side of the Columbia River, where last May it refitted the giant cruise ship the Carnival Cruise Line Legend.